Uglyworld #1481 - Grenoblers Investimagations (Project TW - Image 80-366), a photo by www.bazpics.com on Flickr. 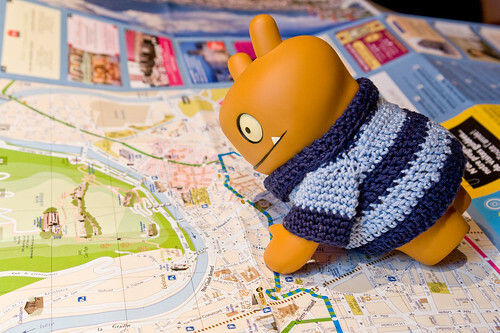 One of the biggerers jobs of a travellerer is to makes sure that they undermastanders exactlies where they is at all timers, and more importantlies is where all the super coolers places is to be founds in their locallers area. Takes today for an exampler, the firsts thingie that I diddereds when I arrivereds in Grenoble, which is in Frances, was to finders myself a mapper of the city so that I could already markers down all the places that I wants to goes and visiters while Baz is at works in the next coupler of days. All I has to says is wowzers, there is justs so muchers to sees in Grenobles, I doesn't thinks there is enoughs time to squeezers it alls into a coupler of daysies! Massivers mountains surrounderings the city which is downs in the valley, a biggers river flowings through the middlers of it, and holy shamolie, literallies an unimaginablers amount of coolers old builderings and statues! I thinks I may needs to talk Baz into comerings back here agains some timers!